Pies at Pizza Taglio in East Liberty. 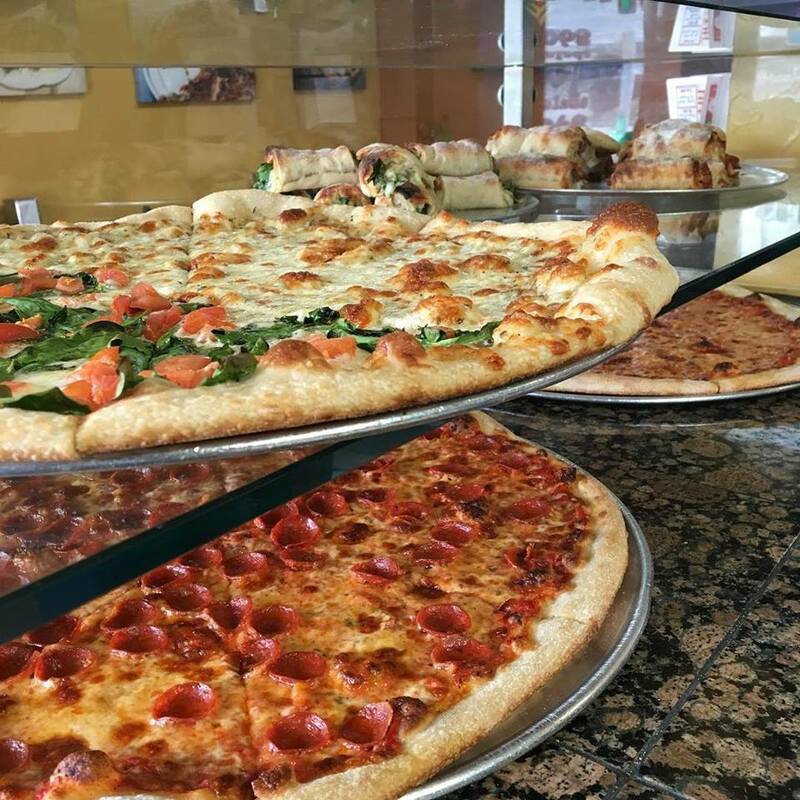 There was once a time when going out for Pittsburgh’s best pizza could only mean deciding between Mineo’s and Aiello’s. But while this rivalry still rages for some families, our city is experiencing a serious pizza boom. A 2013 study counted 9.9 pizza places per 10,000 people in Pittsburgh — putting us only behind Orlando (Orlando?) as the American city with the most pizza places per capita (Orlando?). And plenty of places have opened since then. This pizza counter upstairs inside The Pennsylvania Market offers ample square slices with a range of toppings, including some you probably never considered. Go ahead and be adventurous: The mashed potato and pesto is actually delicious. 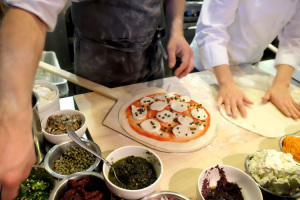 And their dough, made with carefully calibrated hydration and fermentation times that are updated each day on the eatery’s back wall, creates a chewy, crispy, delightful bed for everything from classic grandma slices to those heavily laden with toppings. Iron Born’s carmelized crust. Photo by Jason Waltenbaugh. 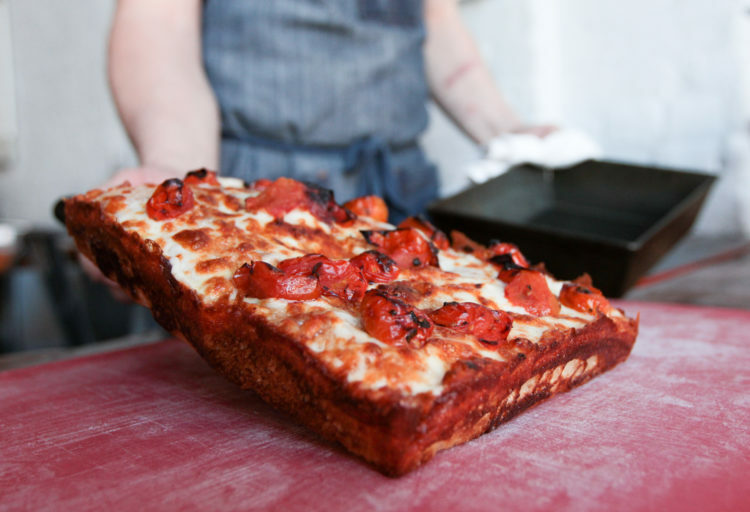 A few years ago, Detroit-style pizza hit Pittsburgh like a runaway Buick, and the pizza scene has never been the same. It’s thicker than the usual thin crust, with a caramelized, cheesy, crunchy edge and a soft, chewy rectangular crust. This spot was born in Smallman Galley’s restaurant incubator — and proved so popular, they’ve remained there for two years. In June, Iron Born will move to a standalone space nearby in the Strip, and they’ve opened a location in Millvale. The white sauce Forager Pie is a particular favorite, topped with piles of fresh mushrooms and ricotta, and drizzled with honey. Forget the pleasantly greasy, all-American pizza pies so many of us grew up eating. This pizza is a different beast entirely — ultra-thin Roman-style pies with high-end ingredients. The crust is crispy on the edges, and a little gooey near the center, yet somehow holds its shape. 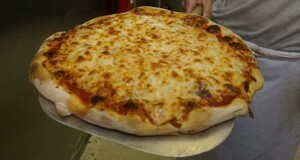 The Greenpointer is a great red sauce specialty pie, with mozzarella, spicy Calabrese soppressata and Mike’s Hot Honey. Tossing the dough at Caliente Pizza & Draft House in Monroeville. Photo by Kristy Locklin. These pizza people have ambitions. Not only are the folks at Caliente opening places at a furious rate, they’re also putting their pies to the test on the national and international level. 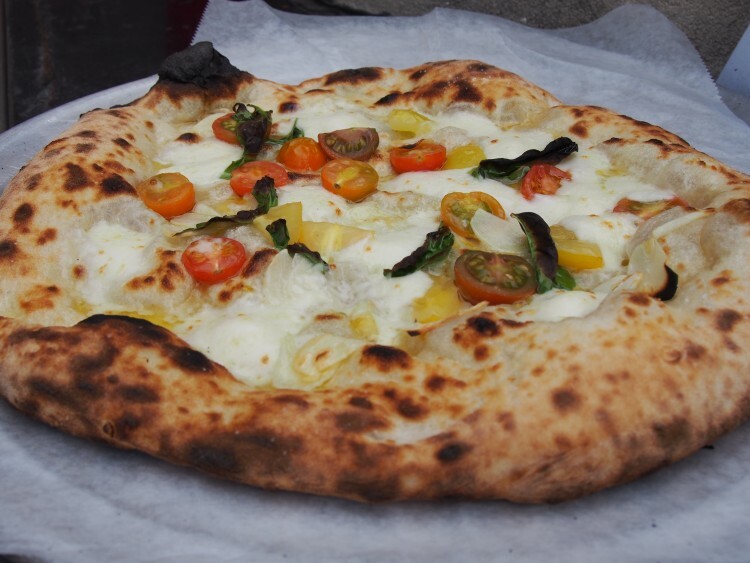 They’ve won awards at the Super Bowl of Pizza — the Pizza World Championship — including first place for nontraditional pies like their Wagyu Beef Truffle Fromage, and the duck-topped Quack Attack. A great place for creative, unusual pizzas (and the wings are excellent, too). Driftwood seems to imply that there’s a certain amount of destiny at stake — this piece of wood, shaped by the inexorable action of the waves, washed up on this particular beach at this particular time. 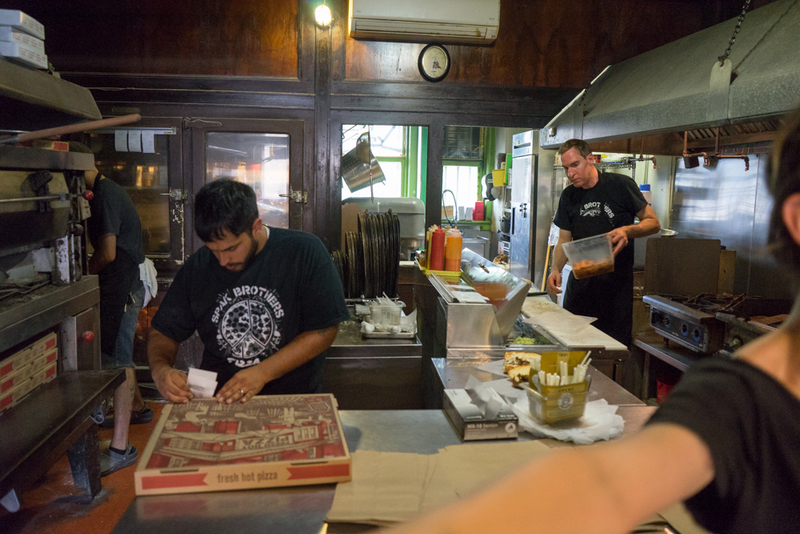 Well, these guys were destined to make some of the best pizza in Pittsburgh, according to Chrissy Teigen, Bon Appétit magazine (who gave them a Top 50 Best New Restaurants nomination), and us. Their distinctive sourdough pies are created with care. 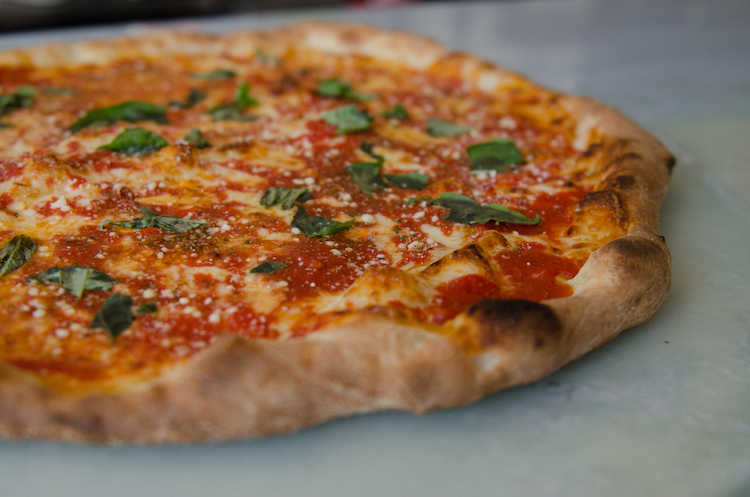 A Mason’s Best Friend white pie features mortadella and spicy pickled peppers atop ricotta, mozzarella and fresh garlic. You can also get Roman-style rectangular cuts, called “Omi’s Slices,” like the Red Top, with pecorino Romano, oregano, olive oil and sea salt. They work with an array of Pennsylvania purveyors, getting items like hand-pulled mozzarella from Caputo Brothers Creamery in Spring Grove, PA. Even the dough is made with Pennsylvania-grown grains. 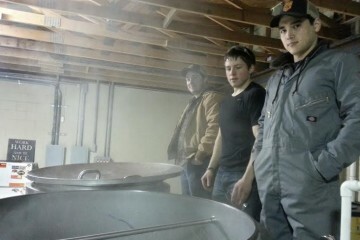 Spak Brothers Pizza. Photo by Brian Conway. Like it was designed by some kind of laboratory, Spak Brothers’ pie is such a perfectly-proportioned arrangement of cheese, sauce and crust (thin) that you just can’t quibble with anything. Not too greasy, not too floppy, not too cheesy (okay, that’s not really a thing). If you hate perfection, by all means go elsewhere. Bonus: Vegetarians and vegans aren’t an afterthought here and can get seitan as a topping. Photo courtesy Slice on Broadway. This is just a great all-arounder — perfect when sold by the slice. Slice makes a well-balanced thin-crust pie, with an incredible array of toppings. Try the meat attack Slaughterhouse Five (bacon, capicola, pepperoni and prosciutto atop red sauce) or go lighter with the Garden (baby spinach, mushrooms, artichoke hearts, black olives and roasted red peppers). For those brave, truly hungry souls out there, they also do a Lasagna Pizza on thicker crust. If you do one thing supremely well, then you should never stop doing it. 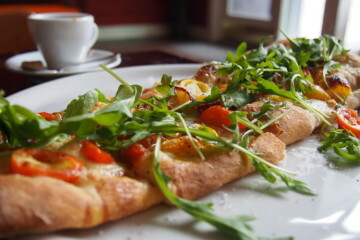 For Piccolo Forno, that’s pizza. When it opened on Butler Street in 2005, Lawrenceville had barely begun to shake off its postindustrial doldrums. 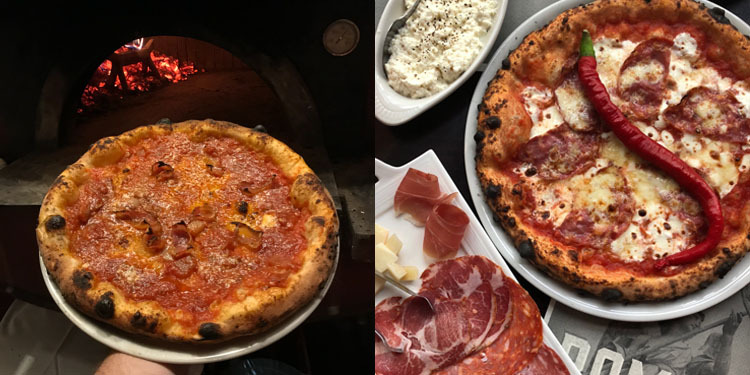 Even though others make credible Tuscan-style wood-fired pizza now, Piccolo Forno still packs in the crowds. The Mortadella e Pistachio is a particularly inspired pie. Luckily, if you have to wait, they also own the adjacent Grapperia Bar Classico (around the corner), the most Italian bar in Pittsburgh, serving grappa, amari and cocktails. At Dinette. Photo by Brian Cohen. Started in 2008, Dinette is one of the foundations of Pittsburgh’s culinary renaissance and a pizza laboratory without peer. The pies here lean towards the creative side, showcasing ingredients like royal trumpet mushrooms, chorizo, salt-cured anchovies, Brussels sprouts, mustard greens, even tuna. If you’re just looking for a standard fill-you-up pie, this isn’t the place. Come here for something more surprising and you won’t be disappointed. Fiori’s pizza. Photo by TH Carlisle. The secret sauce to this South Hills classic is, in fact, the sauce. A lot of places put minimal effort into this element, though it’s actually as essential as crust, toppings and cheese. Fiori’s is a sweeter sauce, which elevates their otherwise fairly standard pie into something great. Wait, no, maybe it’s really the cheese — just gooey and chewy enough in all the right ways, yet less of a project to eat than, say, Mineo’s. The puffy, crispy crust and just the right amount of grease also set this place apart. Pizza from DiAnoia’s Eatery. Photo courtesy of DiAnoia’s. This place does so many things well, that pizza could easily be an afterthought. It’s not. Their wood-fired pies are perfectly thin and crispy around the edges, with sparing use of top-quality cheeses and ingredients. They do a breakfast pizza here — which varies on different days, but often features a fried egg on top — that actually expands the vocabulary of pizza in Pittsburgh. Plus, it’s fun to say “Dee-Annoy-Ya’s.” Pizzeria Davide will be their new stand-alone takeout and delivery spot next door.